One of the most pressing challenges cannabis executives face in emerging markets is estimating how many new patients will sign up for a medical marijuana program once the first dispensaries open. An analysis of trends that played out in three states this year shows that growth rates can be all over the board. But in each of these markets more patients did indeed join the MMJ program leading up to the launch of dispensaries – and in the months after as well. That’s good news for entrepreneurs in states that are in the process of establishing medical cannabis industries and preparing for the start of sales. Delaware, Massachusetts and Nevada all legalized the sale of medical cannabis through licensed dispensaries within the past four years, saw the grand opening of their first dispensaries within the past few months and had patient registries up and running for at least a year prior to their opening. The trend and overall acceleration in the number of registered patients leading up to the opening of the dispensaries in these states played out in very different ways, hinting at the impact specific regulatory frameworks and timing can have on the growth trajectory of a market. A host of other factors can play in as well, including the medical conditions list and overall access to dispensaries. When looking at the rates of growth since the beginning of 2015, the obvious outlier among these three examples is Nevada, which legalized medical cannabis all the way back in 2000 but didn’t establish a framework to legally produce and sell it until 2013. Until the first dispensaries opened late this summer, patients could obtain cannabis through home growing, caregivers and – for a brief period – unregulated dispensaries. So the state already had a robust patient base even before licensed dispensaries launched. The result: In the three months leading up to the first dispensaries finally opening in August, the registry only grew by 8%. This was likely attributable to most patients already being reasonably able to obtain cannabis, and suggests many are likely taking a “wait-and-see” approach to the new regulatory environment. That being said, Nevada’s registry still grew by over 1,500 patients from January to August, when the first dispensaries opened. It has since grown by almost another 2,000 patients and currently stands at about 12,000, for a respectable year-to-date growth rate of 41%. This insight could be useful for business hopefuls in Hawaii, which also has had a patient registry for a while but only recently legalized dispensaries and is now going through the licensing process. In the other two states Marijuana Business Daily analyzed, circumstances leading up to the opening of the first dispensaries were quite different. Medical marijuana was legalized in Delaware and Massachusetts in 2011 and 2012, respectively, and both saw the long-awaited opening of their first dispensaries in late June of this year. Additionally, because both of these states opted to ban or severely restrict home growing, patients really didn’t have access to cannabis prior to dispensaries opening. The outcome has been a virtual explosion in the size of these states’ registries in the months leading up to and since the grand openings. Delaware’s registry more than doubled from January to June, while Massachusetts’ registry also grew by an astounding 146% during that time. While the number of patients in Delaware – about 540 currently – pales in comparison to the nearly 15,000 patients in Massachusetts, it makes the growth in the latter’s registered patient count all the more impressive. It’s also important to note the continued growth in patient counts in all three of these states subsequent to dispensaries opening. 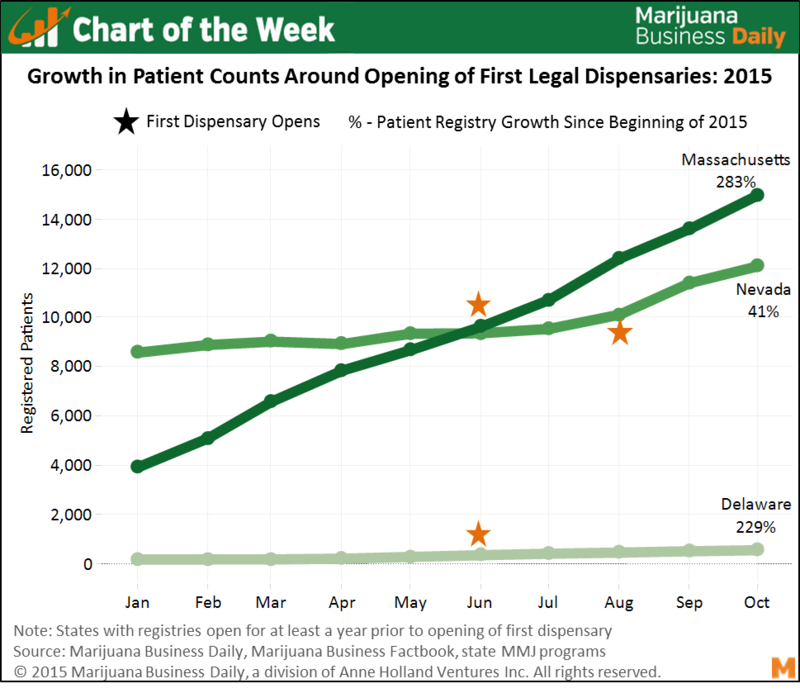 Massachusetts and Delaware are still averaging healthy double-digit monthly increases in patient counts, and though Nevada’s growth rates since dispensary openings are comparatively a bit more modest, an average of 1,000 patients have still joined the registry each month since dispensaries opened. Entrepreneurs in similar markets that are gearing up to come online – particularly Illinois, where initial patient counts are worrying – can take heart in these trends, as they could see sizable spikes in the customer base once dispensaries open. Illinois requires patients be fingerprinted with background checks. As a patient advocate, this requirement has kept many eligible patients away based on privacy principles.